Marijuana plants authorities seized in Washington County in 2009. BANGOR, Maine — One of the men who supervised workers at a massive marijuana-growing operation in Township 37 in Washington County took his own life in February 2011 just days before he was to have testified before a federal grand jury, according to court documents unsealed Friday. A nine-page affidavit for a search warrant in the case outlined details about the operation, considered by police to be one of the most sophisticated ever run in the state. Scott MacPherson’s suicide is mentioned in an affidavit submitted with an application for a search warrant dated Jan. 31, 2012. The warrant, signed by U.S. Magistrate Judge Margaret Kravchuk, sought to obtain cheek swabs from two men who have pleaded not guilty to drug charges in connection with the case. Malcolm A. French, 50, of Enfield and Rodney Russell, 48, of South Thomaston are not included in court documents connected with the case. In addition to French and Russell, three people and a Maine corporation have been indicted on federal charges in connection with the operation, which was uncovered in Washington County three years ago. Kendall Chase, 55, of Bradford, Robert Berg, 49, of Dexter, French, Russell and Haynes Timberland Inc., a Maine corporation, all pleaded not guilty this week to charges stemming from the Sept. 22, 2009, seizure of 2,943 marijuana plants. All four men are free on bail. The name of a fifth person indicted by a federal grand jury has been redacted from court documents. Once the individual is arrested, his or her name will be released, according to the U.S. Attorney’s Office. It took more than 60 state and federal law enforcement officers almost a week that fall to harvest nearly 3,000 high-quality marijuana plants worth an estimated $9 million from a remote area in Township 37 near the town of Wesley and about 10 miles off Route 9, according to previously published reports. 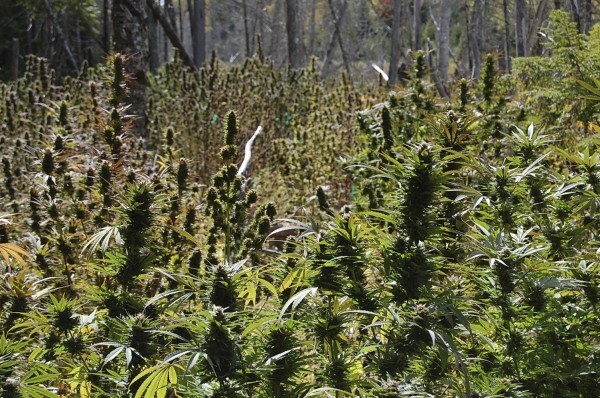 The massive pot plantation was found after a tip was left on the Maine State Police Troop J website, the U.S. Attorney’s Office said in a press release issued Monday. When police flew a plane over the site, people on the ground set fire to several buildings being used as dormitories before the suspected growers fled. CW also told police that the owner of the Grow was Malcolm, according to the affidavit. He picked out photos of French, MacPherson and Russell from a photo array. Information about how Kendall and Berg were connected to the case was not available late Friday.